Ultrasonography is especially important in determining the cause of the sudden onset of abdominal or flank pain, since patients with symptomatic abdominal aneurysms can be difficult to distinguish from those with renal colic. In fact, making an accurate diagnosis of ureteronephrolithiasis is especially important, since renal colic is the most common misdiagnosis in patients with missed abdominal aortic aneurysms. 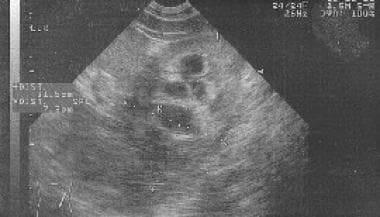 While renal masses and cysts can often be identified by FERS, these are outside the scope of emergency ultrasonography. Patients with suspected renal masses or cysts should be referred to a radiologist for further evaluation. Performance of focused emergency renal sonography (FERS) should not delay the initiation of emergent treatments such as intravenous fluids or pressors, when indicated. Although ongoing resuscitation and extremis are not contraindications, FERS can be difficult to perform in such situations. Patients should be evaluated in the supine position but can be moved to the posterior oblique and lateral decubitus positions for improved visualization. Male patients should have the entire abdomen exposed for the examination. Take special care with female patients to minimize the exposure of sensitive areas. The kidneys are retroperitoneal structures; the right kidney is more caudal than the left. The right kidney is posteroinferior to the liver and gallbladder, while the left kidney is inferomedial to the spleen. The bladder is located in the pelvis. 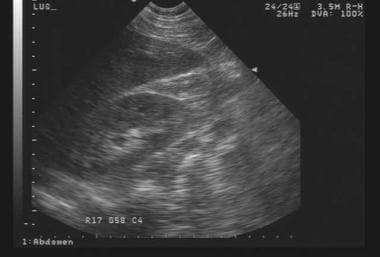 Focused emergency renal sonography (FERS) should include transverse and longitudinal views of both kidneys and the bladder. Visualization of the kidneys should include clear anatomical relationship to the liver or spleen for unambiguous identification. The video below depicts a demonstration of evaluation for renal uropathy. Demonstration of evaluation for renal uropathy. Video courtesy of Meghan Kelly Herbst, MD. Also courtesy of Yale School of Medicine, Emergency Medicine. To visualize the right kidney, the transducer-probe should be placed over the right flank, lateral to the liver. This allows the liver to be used as an acoustic window and avoids interference from air-filled bowel. In addition, the probe can be placed posterior to the liver for improved visualization of the kidney. See images below. Probe placement for longitudinal view of the right kidney. Probe placement for transverse view of the right kidney. Longitudinal view of the right kidney. To visualize the left kidney, the transducer-probe should be placed over the left flank, lateral and posterior to the spleen. This allows the spleen to be used as an acoustic window and also avoids interference from air-filled bowel. See images below. Probe placement for longitudinal view of the left kidney. Probe placement for anterior approach to the left kidney. Longitudinal view of the left kidney. To visualize the bladder, the transducer-probe should be placed over the pubic symphysis and directed inferiorly into the pelvis. A full bladder provides a better acoustic window. Cysts can be mistaken for hydronephrosis. However, cysts tend to be peripheral and hydronephrosis should always be central. If the kidneys are difficult to visualize, reposition the patient in the posterior oblique or lateral decubitus position. 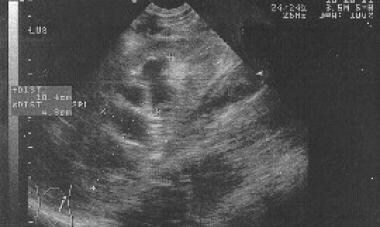 The presence of hydronephrosis does not rule out other pathology, such as an abdominal aortic aneurysm. The absence of hydronephrosis does not rule out urolithiasis. Consider nonstone causes of hydronephrosis, such as urinary retention, pregnancy, and neoplasm. Patients in whom cysts or masses are identified should be referred to a radiologist for further evaluation. Typically, no complications are associated with this procedure. Henderson SO, Hoffner RJ, Aragona JL, Groth DE, Esekogwu VI, Chan D. Bedside emergency department ultrasonography plus radiography of the kidneys, ureters, and bladder vs intravenous pyelography in the evaluation of suspected ureteral colic. Acad Emerg Med. 1998 Jul. 5(7):666-71. [Medline]. Noble VE, Brown DF. Renal ultrasound. Emerg Med Clin North Am. 2004 Aug. 22(3):641-59. [Medline]. 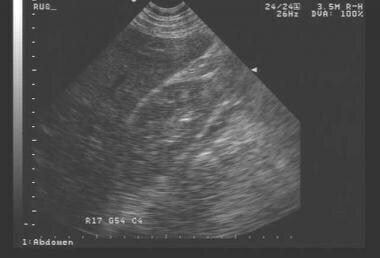 Watkins S, Bowra J, Sharma P, Holdgate A, Giles A, Campbell L. Validation of emergency physician ultrasound in diagnosing hydronephrosis in ureteric colic. Emerg Med Australas. 2007 Jun. 19(3):188-95. [Medline]. Kartal M, Eray O, Erdogru T, Yilmaz S. Prospective validation of a current algorithm including bedside US performed by emergency physicians for patients with acute flank pain suspected for renal colic. Emerg Med J. 2006 May. 23(5):341-4. [Medline]. Dickman E, Tessaro MO, Arroyo AC, Haines LE, Marshall JP. Clinician-performed abdominal sonography. Eur J Trauma Emerg Surg. 2015 Oct. 41 (5):481-92. [Medline]. Hasani SA, Fathi M, Daadpey M, Zare MA, Tavakoli N, Abbasi S. Accuracy of bedside emergency physician performed ultrasound in diagnosing different causes of acute abdominal pain: a prospective study. Clin Imaging. 2015 May-Jun. 39 (3):476-9. [Medline]. Gaspari RJ, Horst K. Emergency ultrasound and urinalysis in the evaluation of flank pain. Acad Emerg Med. 2005 Dec. 12(12):1180-4. [Medline]. Cupisti A, Pasquali E, Lusso S, Carlino F, Orsitto E, Melandri R. Renal colic in Pisa emergency department: epidemiology, diagnostics and treatment patterns. Intern Emerg Med. 2008 Apr 24. [Medline]. Dalrymple NC, Verga M, Anderson KR, Bove P, Covey AM, Rosenfield AT, et al. The value of unenhanced helical computerized tomography in the management of acute flank pain. J Urol. 1998 Mar. 159(3):735-40. [Medline]. Manthey DE, Teichman J. Nephrolithiasis. Emerg Med Clin North Am. 2001 Aug. 19(3):633-54, viii. [Medline]. Levy JA, Noble VE. Bedside ultrasound in pediatric emergency medicine. Pediatrics. 2008 May. 121(5):e1404-12. [Medline]. Levy JA, Bachur RG. Bedside ultrasound in the pediatric emergency department. Curr Opin Pediatr. 2008 Jun. 20(3):235-42. [Medline]. Coursey CA, Casalino DD, Remer EM, Arellano RS, Bishoff JT, Dighe M, et al. ACR Appropriateness Criteria® acute onset flank pain--suspicion of stone disease. Ultrasound Q. 2012 Sep. 28(3):227-33. [Medline]. Ma OJ, Mateer JR, Blavias M. Renal. Emergency ultrasound. 2nd ed. New York: McGraw Hill; 2008. 235. Moore CL, Scoutt L. Sonography first for acute flank pain?. J Ultrasound Med. 2012 Nov. 31(11):1703-11. [Medline]. Herbst MK, Rosenberg G, Daniels B, Gross CP, Singh D, Molinaro AM, et al. Effect of provider experience on clinician-performed ultrasonography for hydronephrosis in patients with suspected renal colic. Ann Emerg Med. 2014 Sep. 64 (3):269-76. [Medline].